Commercial document attestation is important for anyone who wishes to start a business or new branch abroad. It is a mandatory requirement for getting business license abroad. Commercial documents consists of all the documents required for starting a business or opening a new branch/office. It contains all the recorded transaction, certificate of origin, invoice, license of the company, memorandum of articles, articles of association, certificate of incorporation etc. When you plan to start a business abroad or opening a new branch or representative office abroad you have to submit the attested commercial documents for verification purposes. Only after that, you will get a business visa approval. Without attested commercial documents, you will not get commercial license or sponsorship abroad. Chamber of Commerce Attestation:For commercial documents, you have to attest the documents from the respective state’s Chamber of Commerce. 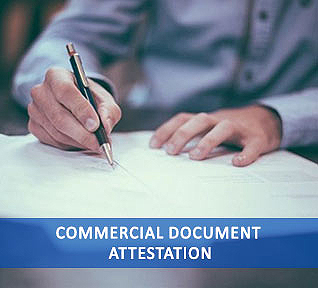 MEA Attestation: After the Chamber of commerce attestation, you need to get the documents attested from the Ministry of External Affairs. Embassy Attestation:Here, the attested commercial documents has to get attested from the embassy of the destination country in your home country. MOFA Attestation:Mofa attestation is required when you reach the destination country. You have to get all your documents and license from the Ministry of Foreign Affairs. Urogulf can assist anyone who aspires to start a business venture abroad by completing their commercial document attestation. We help you to do the attestation on necessary documents without any delay. Other than that, urogulf can assist and guide you in starting business ventures abroad as well as getting a sponsor in Middle East. Our technical team will guide you in right way to smoothen the entire process for you. Urogulf offers you best quality services and will complete the attestation process in the rightful way. You can submit the documents in any of the Urogulf offices across the country. Also, you can track the status of the documents whenever you want from anywhere, anytime.